In the A to Z of Becoming, T is for Thank. So, let me start by thanking YOU. Thank you for following this blog, for reading these posts and for your lovely feedback, likes and comments. You’ve probably heard about the idea of a Gratitude Journal. 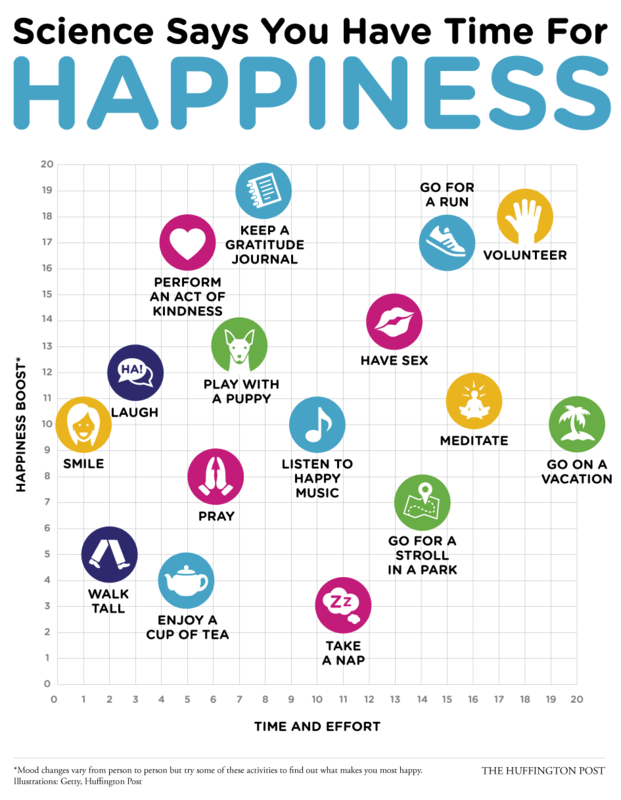 Remember this nice graphic about what makes an impact on happiness? Do you see the one activity which scores highest? Yes, it’s about gratitude. I think there are two ways you can take advantage of this. Firstly, just say “thank you”. How often do you say “thank you” in a day? There are casual opportunities which occur in shops, cafes, restaurants, when someone holds a door open, or lends a hand. Saying “thank you” in those situations can be like a reflex but just allow yourself to notice the “thank you”s…..the ones you hear yourself saying, and the ones you hear others saying to you. Second, try the gratitude journal idea. Once a day, reflect on the last 24 hours and note down what you’ve felt grateful for. It’s hard to go a whole day and not feel grateful for something, and if you aren’t in the habit, starting to practice it will soon make you realise how easy it is to experience gratitude. Finally, what about spiritual gratitude? Whatever your beliefs or traditions, do you thank the Universe, the Cosmos, God, the Life Force? Thank YOU Bob for this and for all the Alphabet blogs. A constant stream of thought provoking bites and nips as well! I have been struggling with two of your recent blogs hoping to make a combined reply to the two, without actually writing an essay! Perhaps this one will make me take action. Hi, Bob – haven’t been responding to your blog for absolutely ages. One thing which I try to do is to say thank you to people and organisations who have helped me or given me good service. It’s all too easy for people to write in and complain about something, and having worked in the past for various local authorities and other corporate bodies, I know just how demoralising and depressing this can be. But whenever I take the time to say thank you to someone – in the electricity company, travel insurance company, local plannoing department, whatever – who has done what I wanted them to do and gone the extra mile (and so many of them do), the sense of delighted surprise which I get from them is almost palpable. I wish people would do this more often.